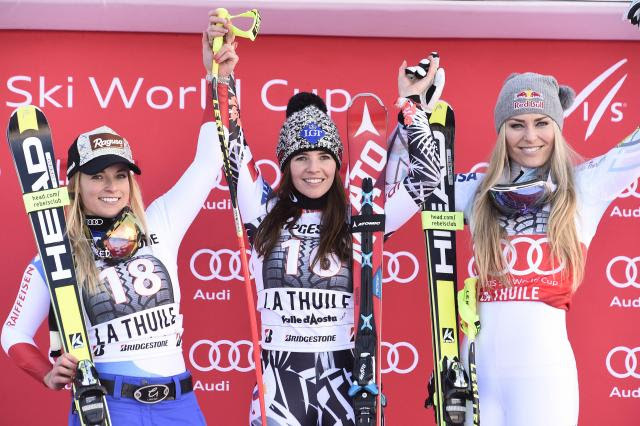 Lindsey Vonn stands with Lara Gut and Tina Weirather on the podium (Getty Images/Agence Zoom-Alan Grosclaude). Vail’s Lindsey Vonn held onto her slim overall World Cup lead over Switzerland’s Lara Gut on Sunday, finishing third in a soft and sketchy super-G at La Thuile, Italy behind Gut in second and winner Tina Weirather of Liechtenstein. Vonn claimed 60 points for third, and Gut got 80 for second. Vonn now leads the chase for her American record fifth overall title 1,200 points to 1,177 for Gut — a mere 23-point margin heading into the final month of racing. “It’s a really big fight to the end of the season,” Vonn said. “We’re almost at the point where you can feel that the (World Cup) finals are coming … and I like that last part of the season.” World Cup Finals, in which all five disciplines are contested at one event, will be held March 14-20 on Gut’s home snow in St. Moritz, Switzerland. Vonn’s 77th career win has proved elusive after she claimed her all-time women’s record 76th victory on Feb. 6 in Garmisch, but Vonn points out it’s actually difficult to win World Cup races. Vonn was second in Saturday’s downhill at La Thuile after losing a ski and crashing out in Friday’s downhill. On Saturday she wrapped up the season downhill title — the ninth of her career and 20th discipline globe, an all-time record. Up next, the men and women’s World Cup tours converge at a city event in Stockholm, Sweden Tuesday and Wednesday. Vonn and Resi Stiegler, of Jackson, Wyoming both plan on competing. Slalom specialist Mikaela Shiffrin is not expected to attend after recently coming back from knee surgery. The Eagle-Vail racer returned to snow just two months after a serious knee injury and won a World Cup slalom in Crans-Montana, Switzerland on Feb. 15. Shiffrin recently told 120 Sport she’ll return to action next weekend in Andora, which will host World Cup super-G and combined events. The tech specialist is trying to branch out this season in order to compete for the overall title in the future. She claimed her first ever speed-event points in a Lake Louise super-G on Dec. 6 before injuring her knee in training the following weekend. After Andora, expect to see Shiffrin at slalom and GS races at Jasna, Slovakia, March 5-6, followed by super-combined and super-G races at Lenzerheide, Switzerland, March 12-13 and then the World Cup Finals in St. Moritz March 14-20.